Printing proofs of an acceptable quality for clients can prove to be an expensive business. If you go down the cromalin route then an A3 proof can easily cost you £50. Add in the hassle factor of not being able to have your proof when you want it, and the lure of an in-house solution begins to look very attractive. 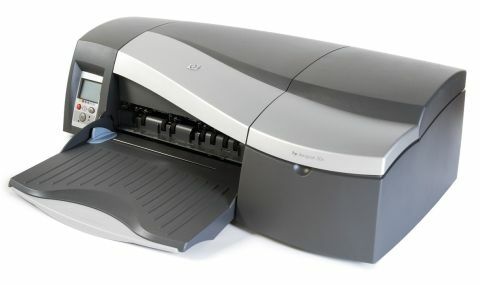 The HP Designjet 30 is an entry-level proofer that offers an alternative to cromalins. It can handle paper sizes up to A3 , and it uses a six-ink colour system with large-capacity, single-colour ink tanks for lower running costs. The ink system produces lightfast proofs and, when using HP's closed-loop colour calibration system, you get accurate proofs that you and your client can rely on. And all this convenience costs a mere £535, which is no more than a conventional A3 printer from the likes of Canon. But before you trot off to place your order with an HP reseller, there are a few things you need to know. Firstly, this is not a photo printer that can hold its own with the likes of Canon's Bubble Jet 9950. That doesn't mean to say that it can't print out good photos, just that it's not the ultimate in photo printing. That said, HP doesn't tout the Designjet as a photo printer but as an all-round colour proofer that happens to be able to turn out a more-than-passable photo. With that small clarification out of the way, we can move on to discuss the Designjet's really good points. For starters, the ink tanks that feed this monster are individual and contain up to a whopping 69ml of ink. That's good going when compared to the 7ml contained in some of HP's consumer models. The ink is fed to replaceable printheads, which is another good point in the Designjet's favour. It means that should the printheads ever clog up, you can replace them for a mere £20 a shot. That's around £120 for a complete set. As far as print resolution goes, the Designjet 30 can manage a very respectable 2,400x1,200dpi. This is high enough to produce great proofs, and the accuracy with which it prints can be further enhanced with the optional HP PostScript RIP. The RIP will set you back another £200 plus VAT, but it does mean that EPS artwork and type will be rendered accurately and without prior conversion to a bitmap. Other optional accessories include a network adaptor and additional paper trays. Frankly, you wouldn't really want to print on paper much smaller than A3, as the Designjet's paper tray isn't particularly good with small sizes, especially 4x6 postcards. Economy is good and, with each ink cartridge costing around £30 to replace, it had better be. Add in the cost of the A3 proofing paper and we reckon you're looking at around £5 each proof... that's about a tenth of the cost of a cromalin. When it comes to print speed, the Designjet is a little slow and the built-in fan that keeps things cool can be very annoying in a small room. To the front of the printer is an LCD status window that gives a graphical representation of ink levels remaining and general status of the unit. It's not the prettiest printer in the world and certainly takes up a big chunk of deskspace, but it's functional and extremely well built.